The knee joint is a bicondylar synovial joint, which allows for flexion, extension and only minimal medial and lateral rotation. The shape of the knee joint means that it is relatively weak, and so it relies on muscles and ligaments to ensure its stability. The lead knee joint is particularly vulnerable to damage and pain because it not only has to absorb pretty much the full weight of your body through impact, but also the additional compressive force generated when you post up with the lead leg and the shear forces created as the upper body rotates at speed above it. 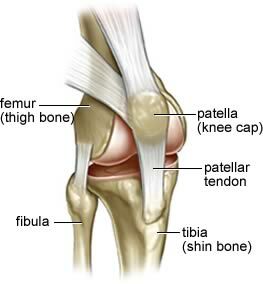 Over time, this can overload the tendon that connects the kneecap to the shin bone and cause patellar tendonitis. You're more likely to experience knee pain as you get older, as cartilage and ligaments weaken over time, and if you are overweight, because each extra pound delivers about five additional pounds of pressure onto the knee during the swing. If your knee discomfort is simply down to overuse, it is likely that you have just sprained or strained your knee in which case the knee tissues have stretched, but aren't permanently damaged. Most sprains and strains can be managed yourself with protection, rest, ice, compression and elevation (PRICE) and, if necessary, painkillers. 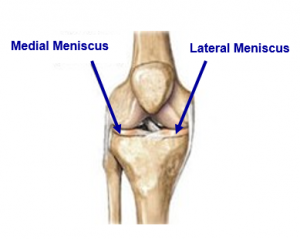 Between the upper and lower leg bones at the knee joint there are rubbery pads of tissue called menisci, which act as shock absorbers to cushion the bones and can be torn if, while weight-bearing, the knee is suddenly or repeatedly twisted. This, for obvious reasons is one of the more common knee injuries in golfers. It can cause pain, swelling and occasionally locking of the knee. Perhaps the biggest drawback, however, is that, once damaged, arthritis tends to set in. Many golfers have tight back and hip muscles and their attempt to generate a full turn in the backswing places unhealthy additional stress on the trail knee, often leading to medial meniscus injury. Weight transfer in the downswing demands that the inner side of the lead knee absorb a huge amount of torque and compression. Tight hip muscles can cause problematic changes to joint alignment at the knee and restricted rotational range of motion in the hips will tend to transfer rotational forces into the knee, thus adding to the already significant amount of torque and valgus stress generated at the lead knee in the downswing and follow-through. 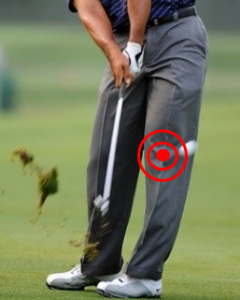 Given that many golfers square the lead foot and lock the lead knee in an internally rotated position through impact, this increases shearing force on the knee joint still further, making it even more susceptible to injury and, perhaps unsurprisingly, nearly twice the number of injuries occur in this part of the swing as compared to the backswing. The typical injury is once again to the medial meniscus and can lead to degeneration of the articular cartilage and eventually to arthritis. Therefore, every effort should be made to alleviate these potentially harmful shearing forces being applied to the knee. Externally rotating the lead leg 20°-40° can reduce twisting. If you watch Bubba Watson, you’ll notice that he actually externally rotates his lead foot in his follow through, thus further reducing stress on the knee. This is made possible because, by this time, most of his weight is in his lead heel, leaving the front portion of the foot relatively free to rotate. When your feet are completely ‘rooted’ to the ground by spikes/cleats, the rotational force of an aggressive swing puts you at a high risk of injury if the knees or ankles are not able to withstand the force repeatedly over time. Wearing soft spikes can help and it’s a good idea to remove the spikes from your shoes on dry days and when practising, as a little less grip allows for minor slippage and thus can decrease rotational stress within the knee. It is also beneficial when walking around the course, because it will also decrease rotational stresses in the knee during normal walking. While on the subject of footwear, golfers with flattened arches in their feet will likely suffer knee pain unless they wear appropriately designed orthotic supports in their shoes. Inadequate arch support will leave the foot in a pronated position, which places extra compressive and rotational forces onto the knee. Walking 18 holes with altered knee alignment, often on undulating terrain (and in and out of the odd bunker, more than likely!) can lead to a significant amount of knee pain. By way of summary, if the knee joint is to be afforded maximal protection against injury, it is therefore important not only to ensure that the muscles surrounding the knee joint are strong, flexible and balanced, but also that the hips and back are sufficiently stable and flexible. As always make sure that you warm up appropriately before every round and never continue playing while suffering with a knee complaint as it will only serve to worsen the injury and lengthen your eventual recovery time.